As it has for over fifteen years, each issue of the Corporate Governance Advisor analyzes the hottest issues and developments thoroughly to arm you with the information you need to protect your company or client more effectively. With the Corporate Governance Advisor, you will always be prepared to deal swiftly and effectively with the critical and fast-changing evolution of governance developments, as wrought by Congress, the SEC and the courts. Every other month, the Corporate Governance Advisor gathers the timeliest information directly from the practicing professionals on the forefront of the industry. How are companies responding to the demands of their institutional investors? What are companies doing to select and evaluate their directors? What changes in executive compensation practices are necessary now? These are just some of the many issues being raised in a broad-ranging reexamination that is being conducted throughout this country under the general banner of corporate governance. Published six times a year, the Corporate Governance Advisor addresses these questions and many others. 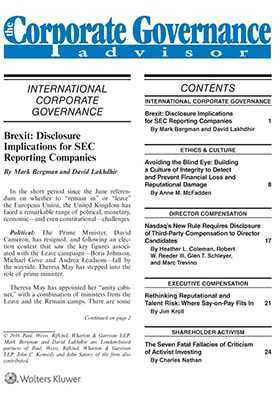 It provides up-to-date, insightful coverage of corporate governance issues, with thought-provoking analysis and timely news reporting. The Corporate Governance Advisor monitors developments in Congress, the state legislatures, the SEC, the state securities regulators, other regulatory agencies, and securities exchanges with the assistance of RiskMetrics' Institutional Shareholder Services Division.